Uganda Breweries Limited (UBL) has today commissioned and handed over 16 boreholes worth UGX 480M to over 4,800 beneficiaries in the sorghum farming communities in Agago, Amuru, Gulu and Nwoya districts in Acholi sub region, Northern Uganda. This is in addition to the 15 Boreholes commissioned in 2014. The boreholes were handed over to the community leaders at Koro - Rom village in Amuru in response to the plight faced by those communities whose main water source dries up during the dry season. While handing over the boreholes, UBL Finance Director - Busola Doregos said the water sources will change the community’s life positively and improve their standards of living, stressing UBL’s commitment to water, sanitation and environmental sustainability. The Amuro district chairperson, Peter Douglas Okello tasked the communities to protect the water resources jealously and use the new boreholes to improve their livelihoods. ‘’These water sources are now yours. You must make sure that they effectively benefit our communities by keeping them clean and making sure they are repaired whenever they break down.’’ Okello stressed. On the same day, Uganda Breweries Limited (UBL) also announced that they will be offering 30 scholarships to young, academically talented but financially challenged students from the farming communities in Acholi sub region in Northern Uganda. Under this project, Uganda Breweries will pay total fees of up to UGX 348,117,000 for the students to study from Daniel Comboni Vocational Institute and Kitgum Technical Institute. The sponsorship will entail payment of tuition for their second year of study, entrepreneurship training as well as seed capital for those that would have extremely excelled in the programme. While announcing the sponsorship fund at the UBL offices in Gulu, UBL Finance Director, Busola Doregos expressed the company’s commitment to continue giving back to the farming communities who provide raw materials for the brewery. “Even though as a company we inject more than 24 billion shillings in these farming communities yearly, like most of us, these farmers have a challenge seeing their children go on to tertiary education due to high tuition and upkeep costs. We have therefore come in to support very deserving students in these communities who struggle to raise school fees.” Doregos said. The sponsorship will be managed and run on UBL’s behalf by a technical expert, Enterprise Uganda, who will be in charge of the selection process based on merit from academic performance, aptitude and business plans. Enterprise Uganda is the right partner for this due to their vast experience in SME development, training and mentorship in entrepreneurship. Over the last 17 years, Uganda Breweries Skills for Life programme has awarded over 200 university scholarships across East Africa, with 40 of them from Uganda. 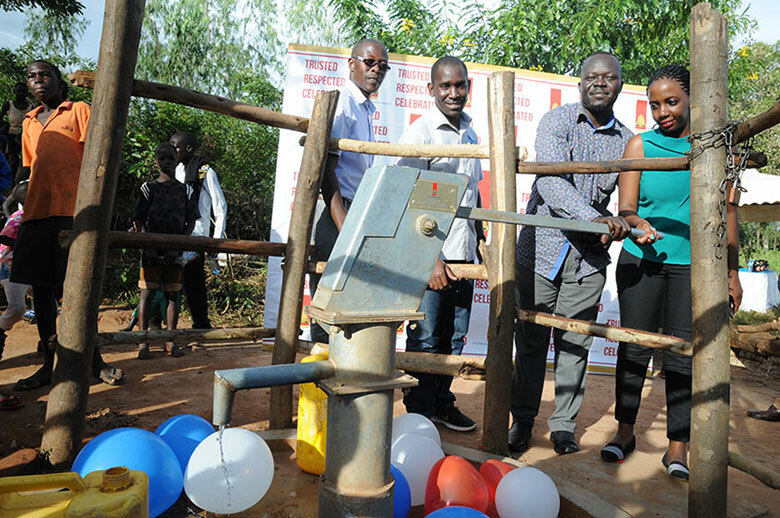 Uganda Breweries Limited (UBL) has today commissioned and handed over 16 boreholes worth UGX 480M to over 4,800 beneficiaries in the sorghum farming communities in Agago, Amuru, Gulu and Nwoya districts in Acholi sub region, Northern Uganda.